Hobo With a Shotgun is a Canadian genre film. 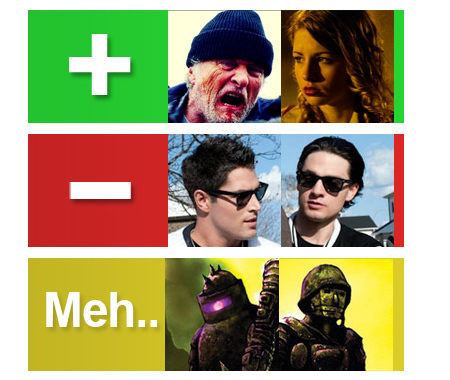 I have a general rule that unless your name is David Cronenberg or Guy Maddin, you should generally find the Canadian genre film to be pretty weak. To catch anyone up to speed on Canadian cinema, modern Canuck films fall into two camps, they are either French-language arty dramas made in Quebec or hard to stomach films that should’ve been made-for-tv such as Bon Cop, Bad Cop or Gunless. A unique third category are what I call the secretly Canadian, which includes films like Splice and Resident Evil: Extinction that are part Canadian part French and German productions respectively. But these films aren’t usually directed by Canadians nor do they prominently star Canadian casts so I don’t count them. Having the Canadian tag attached to it, I walked into Hobo With a Shotgun with some hesitation. At first, all my worst fears came true. Camera work looked shoddy, the main villains in the film do not inspire me to hate the characters, but the actors portraying them. I was ready to slump uncomfortably in my chair when all of a sudden, something rare happened. It’s unusual for my opinion on a film to change midway through, but as soon as Rutger Hauer picks up his weapon of choice, my attitude towards the film took a total flip. The film felt tighter, and Hauer character lept into basass territory making watching the film a much easier experience. On top of Hauer, we have his sidekick Abby played by Molly Dunsworth who has minimal dialouge and screentime, but shines brightly in her role. 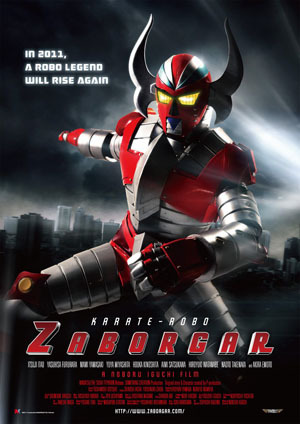 The obnoxious villains get also get a backseat to a duo of robotic soldiers known as The Plague. They aren’t super interesting, but they also don’t talk making them infinitely superior to the other duo. 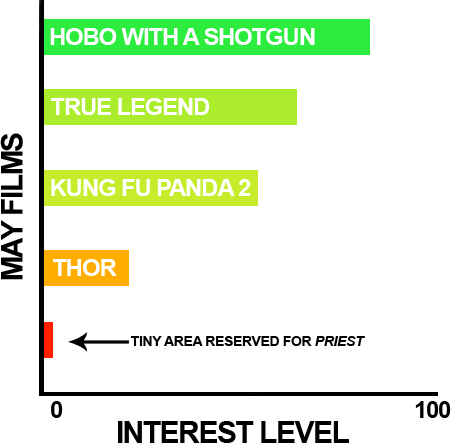 Here’s a handy chart to hear what I’m all about. Hobo does not avoid the Canuck trait of showcasing how Canadian it really is. I usually find these home country elements a bit forced, but there are some good injokes in Hobo. Let’s get the bad ones out of the way first with George Stroumboulopoulos, a former MuchMusic VJ and current CBC host making a cameo as a newscaster. This wouldn’t bother me so much if people didn’t cheer when they saw him in on the screen at the Mayfair. Next we have gratuitous use of hockey skates in the film. Oi. Do we have to fill in every Bob & Doug McKenzie stereotype? Doesn’t do it for me. Now let’s get to the better Canadian tropes. Yes! 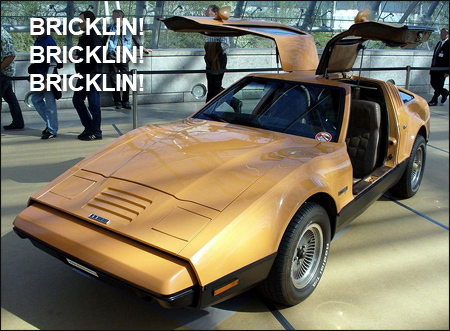 A Bricklin! This retro-futuristic car fits perfectly with the tone of the film with it’s gull doors and a design that I only thought was only used on my Hot Wheels when I was 5! The car is a Canadian model and is used prominently throughout the film. The next Canadian reference hit me like a brick wall of nostalgia. It’s a total surprise if you are a Canadian of a certain age to hear this song playing in the background. It was such a weird surprise to me that I don’t want to spoil the song here. If you must know what it is, click here. Despite the jump in quality in the middle of the film, there are still things that I should bring up. Hobo With a Shotgun‘s retro-aesthetic may strive for a John Carpenter and The Warriors style, but it comes off slightly miscalculated feeling more like a Troma film than Escape From New York with it’s over the top splatter and robotic villains. Some scenes in the film also make no sense and I can’t be sure if this was done purposely or not. One example is during a montage when the Hobo is taking revenge on the deadbeats in town. This scene involves Rutger entering a room with the shotgun barrell pointing in his mouth. He starts laughing. The villains start laughing. Then he pulls out the gun and shoots them. But what was going on? How did this work? What!? I’m not even going to mention the octopus tentacles. Hobo With a Shotgun won’t change anyone’s mind on these retro-themed films. 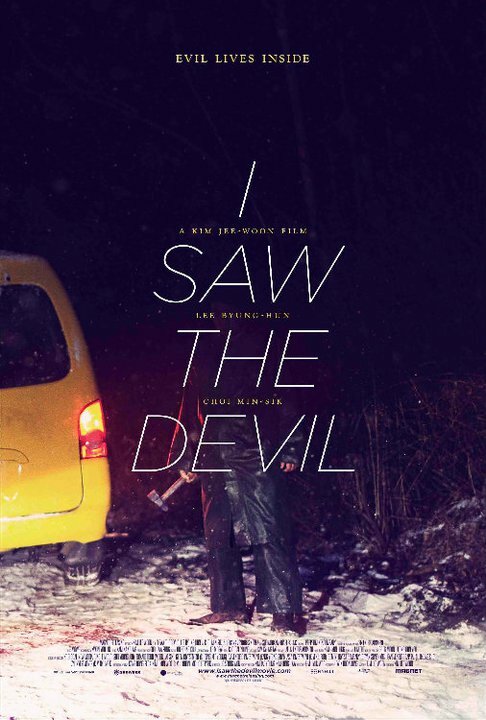 Cinematically, it’s a basic low-budget revenge plot that contains acting and filmmaking of wildly uneven quality. Perhaps even feeling a bit like a film made by University students who managed to get a hold of Rutger Hauer. I had more fun with this film than the bg budgeted Drive Angry, but I’d recommend it mostly to anyone who either love Rutger Hauer, or was born in Canada between the years ’75 and ’85. As for myself, I’m more curious than excited to see what Jason Eisener is planning next.